“What?” I’ve known Tom for 25 years, been married for 21 and never once in all those years did he tell me meatloaf is his favorite comfort food. In fact, I have never in my life made a meatloaf (I do, however, make a pretty good Shepard’s Pie). 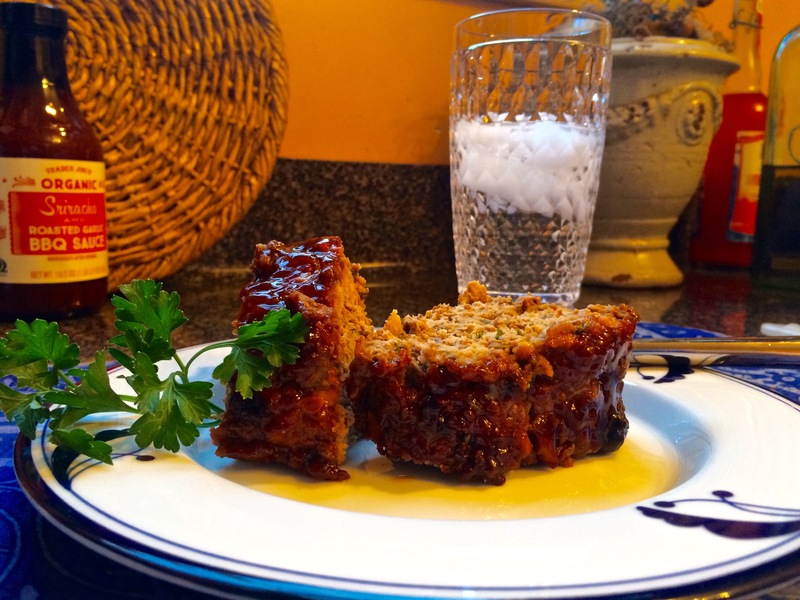 Now that I am back on my feet again, I decided to try Chef Mauro’s meatloaf recipe, and man we have been missing out! This is comfort food at its best. 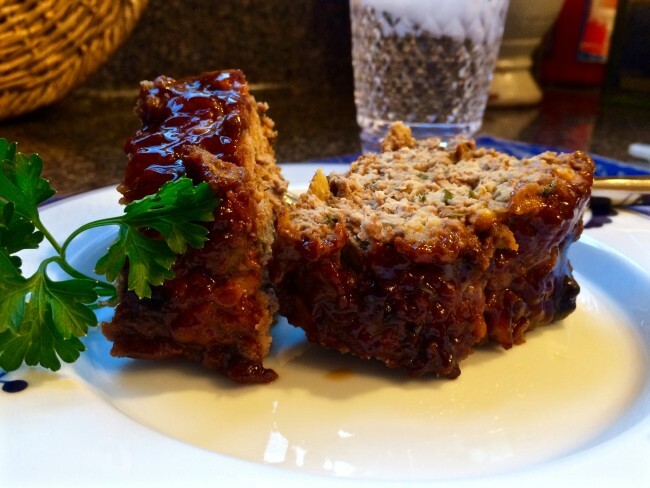 The meatloaf is baked free-form on a baking sheet rather than in a loaf pan, so you get that good crispy crust on three sides, and the BBQ glaze topping spills down the sides and caramelizes around the bottom edges of the meatloaf. YUMMY! Since this is the first time we tried this recipe, I mostly followed the instructions; but being me, I did switch a few things. 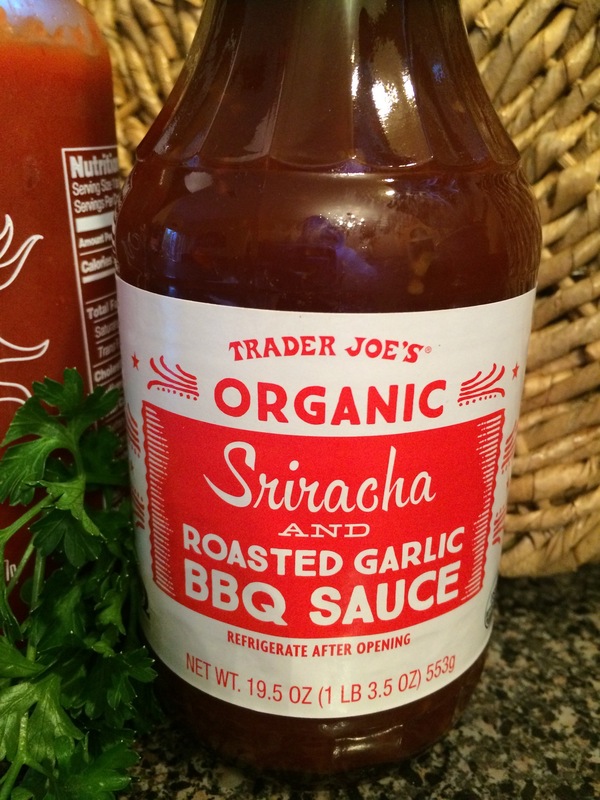 The recipe calls for a glaze of BBQ sauce, brown sugar, apple cider vinegar, and Sriracha sauce. 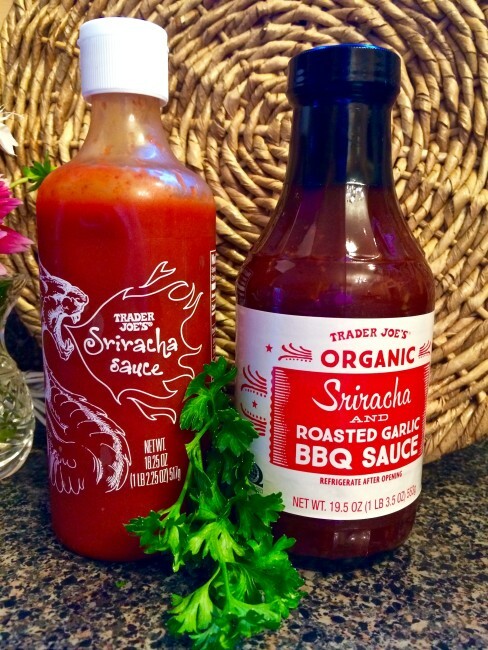 If you haven’t tried it yet, Trader Joe’s has an excellent Sriracha and Garlic BBQ sauce so I used that as my base and added more Sriracha (we like it spicy). Also, as I didn’t have apple cider vinegar, I substituted balsamic. One other note, the recipe calls for 1 lb. ground chuck, ½ lb. ground pork and ½ lb. ground veal. Rather than purchasing separately and mixing, we had our local butcher shop grind this combo up for us ($11 for 2 lbs.). With that big El Niño coming our way, I am sure this will become a regular recipe for us this winter. Recipe Directions: Preheat oven to 350 degrees. Line a rimmed baking sheet with parchment paper. 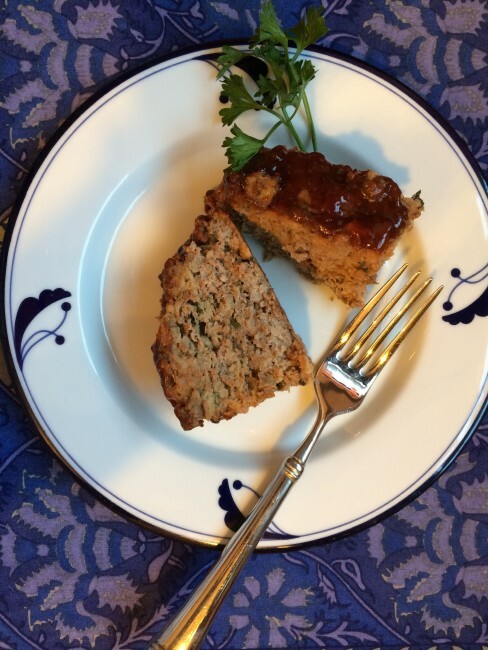 For the Meatloaf: Heat olive oil in a small skillet and sauté the onions until translucent, season with a pinch of salt and a bigger pinch of seasonings, add garlic and sauté for 1 to 2 minutes without letting the garlic brown. Set aside. In a large bowl, whisk the milk, mustard, Worcestershire, hot sauce and eggs, then season with salt and a couple of grinds of pepper. Add the meat along with the crackers, parsley and cooked onion-garlic mixture. Using your hands, mix everything until evenly combined. 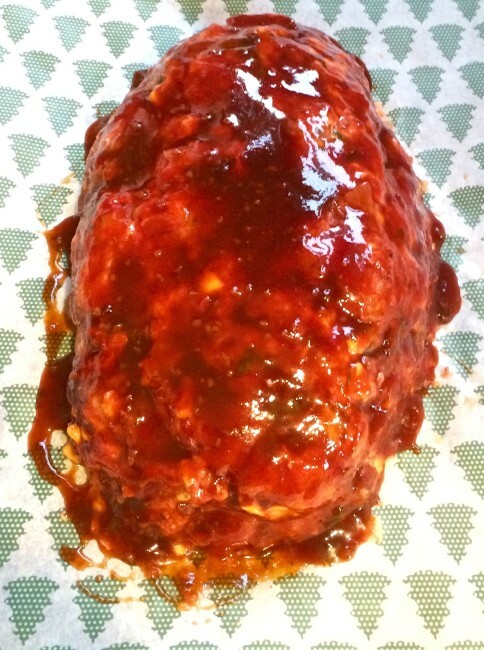 Place the meat mixture on the baking sheet and gently shape into a loaf form. For the Glaze: Combine all ingredients in a small bowl. 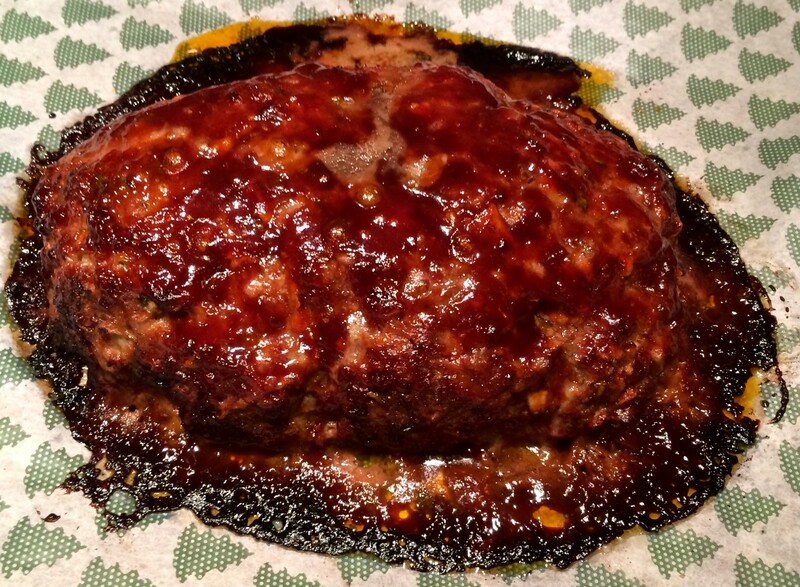 Reserving half of the glaze for later, slather all over the meatloaf, then bake. After ½ hour, baste the loaf with the remaining glaze and continue cooking until internal temperature registers 165 degrees F, about 1 hour. Let rest for 20 minutes before serving. Serves 4.